Maryland’s turtle (fine, "terrapin") is not the most fear-inducing idea for a mascot. But the 1,000-pound bronze version that sits guard at College Park, while intimidating on its own, can be expected to get even more respect after emerging unscathed from a giant fire late Tuesday. The turtle, named Testudo, gets pretty popular during finals week at Maryland, when students bring "offerings" in an effort to attract good luck. Well, those gifts became burnt offerings sometime Tuesday night when Testudo was spotted engulfed in flames, according to the Baltimore Sun. The fire was soon put out, and campus police are investigating. University of Maryland College Park president Wallace Loh said Testudo was not harmed, and photos taken the next day seem to confirm his assessment, with the charred offerings replaced by some get-well-soon treats and a Band-Aid on Testudo’s bronze nose. 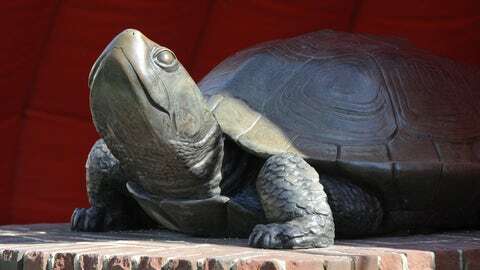 Testudo has been on campus since being cast in 1933 – but the terrapin has been moved several times after attracting a large amount of vandalism and crimes, according to the Sun.